Every labyrinth walk is a unique experience. Some walks are deeply meaningful, others can feel like a fun stroll through a pattern on the ground. Let go of any expectations before walking the labyrinth. The labyrinth is a sacred space, and holds an energy of its own. It inspires insight and intuition, and you don’t have to make anything happen. All you need to do is relax and walk. However, I do suggest that you think about your intention for walking before entering the labyrinth. Do you need guidance regarding a concern? Do you want to release stress and tension? Do you want to express gratitude? I have found that my reasons or intentions for walking differ greatly and are seldom the same. There are some themes that I find repeat themselves in my walks and these might give you an idea of the many reasons that you might be called to walk the labyrinth. Walking to give thanks and to acknowledge all the blessings in my life. This is a walk one can do every day! This is a meditative walk to help me purposefully slow down. I often do this after a really busy time when I need to take time to let my soul catch up with me. For those days when I feel how good it is to be alive, when the sun is shining, the birds are singing. This is a time when I want to celebrate life and I might sing or dance in the labyrinth. For those times when I need to get my life back into balance after a particularly stressful time, or between big projects when I need to refocus. For times when I need to lighten up and let go of a perceived burden. This can also be for times when I feel grief and sadness and need the labyrinth to support me. To celebrate the life of someone who has died, or to remember someone you are missing. Walking with the intention of finding peace within myself so that I can feel what peace in the world might look like. However, your intention can also be as simple as becoming conscious of your breath or of each step you take, and walking mindfully. There is no wrong way to walk the labyrinth. Walk the labyrinth at whatever pace feels right for you, in whatever way feels right for you. The important thing is to walk at a pace that feels natural. Take all the time you need. If you are participating in a group walk and you feel you are going too slowly and holding others up, just notice this thought remembering that everything that happens on the labyrinth is a metaphor. Are there places in your life where you feel that others are making you feel guilty for going at your own pace? If someone else walking on the labyrinth is going slowly and holding you up, feel free to pass that person at the next turn. An easy way to do this is to turn just before the actual turn so you end up in front of the other walker rather than behind them. Remember to be aware of your senses and notice everything that happens on the labyrinth. Relax and enjoy your walk. Let your natural rhythm of walking feel like you are in flow with the path. Walking the labyrinth can help us become more grounded in our bodies, which in turn allows us to become more aware of the messages our unconscious is trying to communicate to us. When you walk the labyrinth become aware of your body by noticing how your feet touch the ground, how your shoulders feel, where there is tension in your body. How does your body move? Notice your balance. Take this connection with your body into your SoulCollage® card-making by becoming aware of how your body responds to images. To do this you have to by-pass your judging mind. By looking only at the images and ignoring any words that might be on the page, you can become aware of slight changes in your body as you look at an image. Do you feel a flutter in your stomach or a quickening of your heartbeat? Is there any sense that the image is communicating with you, or that the image is choosing you, rather than the other way around? Connecting to your senses and listening to your body is an important part of beginning to hear your inner voice and trusting your intuition. Walking is rhythmic, especially if you are conscious of where you are placing each foot, and this connects us to the elementalheartbeat of nature. After your walk, write down any words, phrases, ideas, solutions or images that came to you while you were walking while they are still fresh in your memory. A walk can produce sudden insights on an issue that has been worrying you for months. In all spiritual traditions there is some mechanism designed to get us beyond the surface, beyond appearance, opinion and conditioning, beyond ego, illusion and intellect, beyond imitation and personality. Real freedom lies in going deeper and arriving not at some foreign or unfamiliar place, but at ourselves, our wise, innocent and loving selves. There we find healing and forgiveness and unlimited potential. I’ve found that those walking the labyrinth for the first time are sometimes anxious. If you do not have access to a labyrinth which you can walk, you may use a finger labyrinth as a substitute to experience the pattern of the labyrinth in your body. 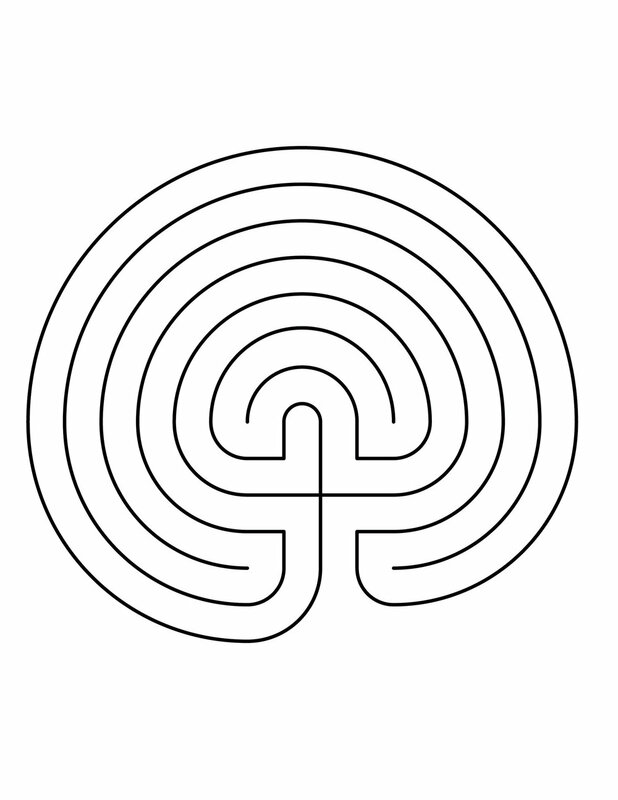 Print out one of the following labyrinths - whichever pattern appeals to you - and write or draw on the path, or just let your finger follow the twists and curves.